We know the opposition against Trump will stop at nothing to take him out of office, even if that means wearing a wire and violating the espionage act in our country's sacred Oval Office. The opposition member who proposed wearing a wire on Trump was none other than Deputy Attorney General Rod Rosenstein. That's right, Rosenstein wanted to wear a wire on a sitting U.S. President elected by our political system and supported by a huge majority of Americans. This should be nothing short of treason and if it were 1775, or even 1900, Rosenstein would be tried as a traitor. But career politicians like Rosenstein know how to skirt "the line" as disgraced FBI agent Peter Strzok, who is also a part of the coup Rosenstein, Strzok, and Comey were leading. The new report of Rosenstein proposing secretly recording conversations in the Oval Office with the President came from a source close to the matter and The New York Times. That is how it works now, members of the deep state, a rogue element within our government, leaks what it wants us to know and controls the flow of the information through the mainstream media. The newspaper said someone familiar with the matter told them Friday that Rosenstein made comments to other Justice Department Officials in meetings in spring 2017 about secretly recording Trump after he fired FBI Director James Comey. That is called a coup. 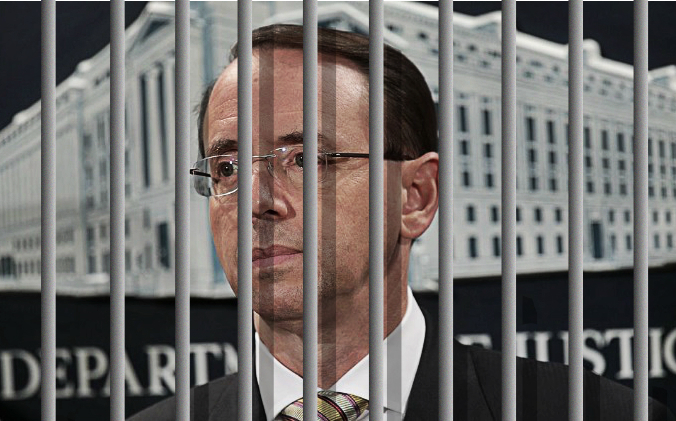 Rosenstein and the source who told The New York Times should both be tried for treason for not reporting through the proper channels at the time that Rosenstein suggested the illegal recording of a sitting, elected, U.S. President. Fear will ensure that will never happen, the source will never come forward and say they are willing to testify to what they heard and Rosenstein will likely never seen so much as a single charge stemming from the failed coup against President Trump. Rosenstein reportedly considered the possibility of recruiting Cabinet secretaries, such as Attorney General Jeff Sessions, and White House chief of staff John Kelly behind an effort to invoke the 25th Amendment. This would allow Cabinet members to remove the president by majority vote if they deem the president is unfit for office yet there has been absolutely ZERO evidence he is unfit for office and the only reason these traitorous snakes want him gone is because he is actually doing all of your jobs for you and making you look bad. The crisis with the Koreas should have been sorted 20 years ago, the war in Iraq should have been over 10 years sooner, the bombing in Syria and the American troops on the ground were never brought before Congress, representatives of the American people, and asked for permission to go to war in Syria. They did it without getting the consent of the people. A Justice Department spokeswoman provided a comment to the Times from a person who was said to be present when Rosenstein made the comments. Rosenstein was quick to respond to the rumor and issued a statement saying, "The New York Times’s story is inaccurate and factually incorrect. I will not further comment on a story based on anonymous sources who are biased against the department and are advancing their agenda. But let me be clear about this: Based on my personal dealings with the president, there is no basis to invoke the 25th Amendment." That is right! Boom! That last sentence is the icing on the cake because Rosenstein knows he has been caught and there is no basis to invoke the 25th Amendment even by his own words! So if it ever comes to light that there is a witness willing to testify or even a recording of some of the wiretapping comments, then Rosenstein would be a proven liar and traitor. Michael Bromwich, an attorney for McCabe said, the former FBI deputy director has "no knowledge" of how the comments were leaked and that would imply that McCabe is acknowledging the leaks are real. "Andrew McCabe drafted memos to memorialize significant discussions he had with high-level officials and preserved them so he would have an accurate, contemporaneous record of those discussions," Bromwich said. "When he was interviewed by the Special Counsel more than a year ago, he gave all of his memos – classified and unclassified – to the Special Counsel's office. A set of those memos remained at the FBI at the time of his departure in late January 2018. He has no knowledge of how any member of the media obtained those memos." This whole time, Americans have been watching the crooked government try everything in their power to stop Trump because they thought the people were too stupid to know any better and they were protecting "us" from ourselves. Trump has been very generous by only going after the proven couple members on Twitter instead of using the full weight and authority of the office of the President.